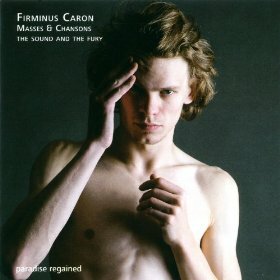 Continuing their forays throrgh the less well-known parts of the Renaissance repertory, The Sound and the Fury now give us almost the entire known works of Firminus Caron (active in the 1460s and 70s) - lacking only a dozen or so secular pieces, The top line is taken throughout by the peerless David Erler, a man who seems unable to produce an inelegant line or a less than lovely sound. And the other four singers are among the most experienced anywhere in the world for 15th-century music. With musicians like these, it is almost enough to put them in a studio and start recording. But you also need intelligent editions, and here the inexhaustible Jaap van Benthem has come to the rescue by reconsidering every detail of the music and effectively replacing the 40-year-old standard edition of Caron. This is in itself a major achievement and contributes enormously to the overall quality of the performances. And a particular welcome to the secular songs, with complete texts and complete forms. Because the songs would seem to be his most successful works. In particular, ‘Hélas m’amour’ (better known as ‘Hélas que pourra devenir’) survives in over 20 sources, more than almost any other song of its decade, and this performance makes it perfectly clear why: it is a marvellous and bewitching piece, crammed with fascinating incident. The only trouble that can arise is if the voices you have at your disposal do not match those expected by Caron. Whereas three of his Masses are scored for a high voice, two tenors and a bass, so they flow effortlessly, the other two have the three lower voices more or less in the same range (they may be earlier): with the Mass Jesus autem the bass singer is so overbalanced as a result that the total sound is really rather unpleasant; the balance is much better in the Mass L’homme armé but here the singers all sound seriously overtired, with rough intonation, approximate rhythms, poorly synchronised entries, tight sound and snatched breaths. It would obviously have been better to give them a rest and try another day but the realities of life can make that impossible. And at least we have all this music now in serious recordings.